Is there a better alternative to tre3rty 2? Is tre3rty 2 really the best app in HTML category? Will tre3rty 2 work good on macOS 10.13.4? 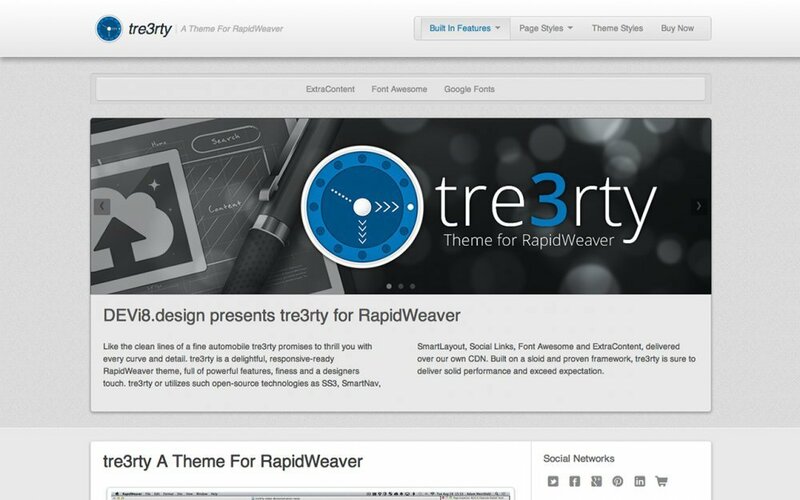 tre3rty 2 is a delightful, responsive RapidWeaver theme, full of powerful features, finesse and a designers touch. tre3rty 2 utilizes such open-source technologies as jQuery, Twitter Bootstrap, Font Awesome, rFrame, SS3, SmartNav, SmartLayout, Social Links and ExtraContent. Built on a solid and proven framework, tre3rty 2 is sure to deliver solid performance and exceed expectations. tre3rty 2 needs a review. Be the first to review this app and get the discussion started!